I’m off to Australia and Thailand this summer and I'm attempting to travel light so I need to mix and match items going from day to night. I know you’re probably thinking the colours aren’t at all selling summer but I’m feeling rather monochrome at the moment, and it would be rude not to, considering its one of this summers’ biggest trends. Also this way I know I can create multiple outfits as everything will blend within the same colour palette and I can add splashes of brights around these items! Another great tip to note is, as nothing is too statement no one should notice it’s been styled more than once. Just because I’m packing minimal doesn’t mean I can’t be savvy! However, I am on a minimal budget and as much as I’d love to spree my way through the rails of Topshop and Zara I need to save what I can for my travels. So I headed over to Newlook.com to get my on-trend travel attire at an affordable price. 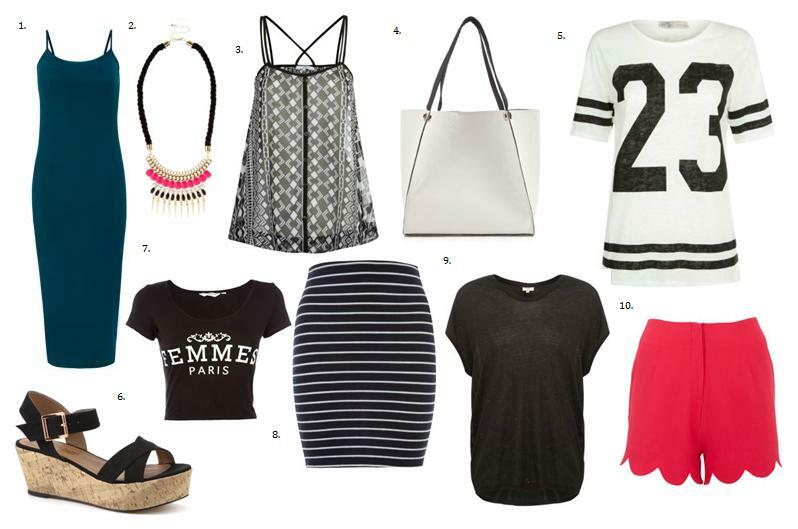 All this came to just over £130 and I can get a total of 11 outfits out of these combos! Many of the items featured here/or similar will be coming with me on my travels so look forward to seeing them pop up in future outfit posts! *Disclaimer: This is a sponsored post however all content is of my own opinion. Amazing picks are per! I am in love with these baseball type t-shirts, I have the one from topshop that practically everyone in the world has - ha! But it goes with so many things. I love the necklace you've chose, but Primark have one nearly the exact same, and its cheap as chips! I love the petrol blue midi dress and the white baseball top. It is amazing that you are going to be able to see the world this summer, I hope you have the time to really enjoy it. There is really a classic trend this summer and these pieces really play into that well.